Nothing says "summer" like a pool party. Of course, you have to let your guests know you're planning a get-together, and the following invitations will help you do it. The following invitations are free and easy to download and customize. 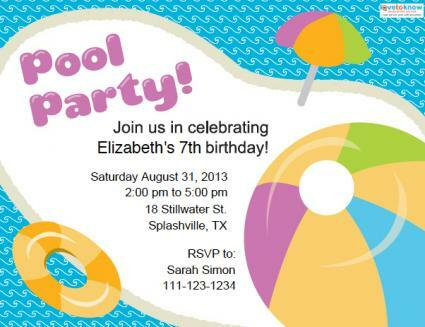 Click on the invitation you want, and then click on the text to replace the sample text with your own party details. Click the diskette button to save when you're finished, and then click the printer icon to print. If you need help downloading the printables, check out these helpful tips. The bright colors on this invitation are sure to catch any child's eye. Click to download and customize this free invitation. 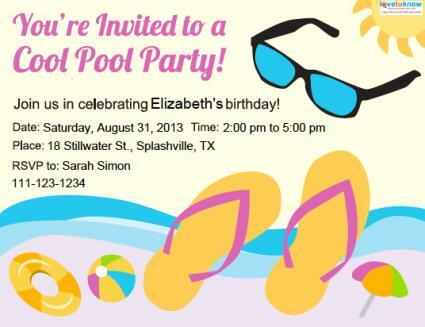 Still bright, but slightly more sophisticated, this invitation is perfect for a teen pool party. 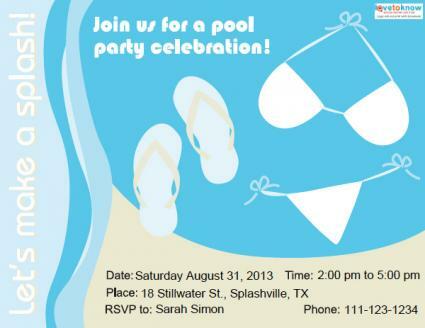 This simple yet stylish invitation works well for any adult pool party. If one of the free invitations above isn't quite right for your party, there are others available for purchase. Keep in mind that the design of the invitation you choose largely depends on the occasion and the ages of the people who are expected to attend your party. 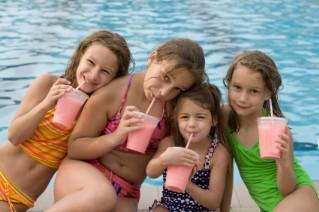 A child's pool party is often combined with another event, such as a birthday, a slumber party, or some other fun occasion. Kids tend to love invitations that feature kids their own age. Picture Perfect Kiddie Pool - Boys will especially like this die-cut invite which features a little boy wearing a scuba mask in a blow up pool. You can opt to have your invitations custom printed, or you can print out blank invitations yourself. Pricing begins just under $15 for a minimum of 10 invitations. Pool Girl - This invitation features an adorable little brunette girl wearing a swimsuit and floating on a pool raft. You can customize every line of this invitation, and pricing begins just under $40 for 10 invitations. Teens are notoriously difficult to please, so be sure to ask your teenager to help pick out the invitations for his or her party. Pool and Flip Flops - This design features an inground pool with flip flops on one side and wet footprints on the other. You can totally personalize it with your info, and you can choose the type of paper it's printed on. The cost is just over $2 per invitation. Graduation Pool Party - This invitation has a fun design with a pool surrounded by a grill, lawn chairs, towels and music speakers. It would make a nice invitation for any teen's party, but it's especially suitable for a young man since there's nothing girlie about the design. Pricing begins around $40 for 20 invitations if you want the company to print personalized invitations for you. If you prefer to print them yourself, you'll pay approximately $20 for 20 invitations. Pool Party - This design features vintage style pool umbrellas, flip flops and beach balls. A subscription will let you print this fun invitation as well as greeting cards all for one low price. Adult pool party invitations come in many styles. Some are cute, others are sophisticated, and some are quite simple yet attractive. Just like kids' and teens' pool parties, you can combine your party with another special occasion and include it in your wording if you like. Night Swim - The stylish design of this invitation will help you let your friends know you're throwing an evening poolside cocktail party. You can choose the font style and color that you want, and pricing begins at just under $24 for 10 invitations. Pool Tide Party - Watercolor shades of blue are the sole design for this invitation, but this works quite well if you don't want to tie your party to a particular theme. You can customize your orders, and pricing is about $24 for 10 invitations. Elegant Pool Party - Splashes of aqua and emerald green combine to create a very unique invitation. Choose the type of paper you want your invitations printed on, and add your own party details. The cost runs about $2 per invitation. Pool parties provide a splashing good time for everyone. Choose invitations that reflect your theme and style, and let all your intended guests know when the fun will begin.